Layered monoprints are colorful and fun! With a Gelli printing plate, all kinds of acrylic paints, texture tools and stencils, you will continue learning how to create beautiful layered monoprints on paper. After creating all these fun prints, learn what to do with them. The fun is waiting for you! As we continue creating layered monoprints on paper, we’re going to explore several kinds of acrylic paint, striping tools, stencils with large openings and more. Remember that one of the best creative questions to ask yourself, is “What if . . .?” Let your imagination have fun as you look around your space. Try anything to see what kind of impression it might leave on the Gelli Plate. Remember to apply and stamp extra paint on your protective paper or in a journal. 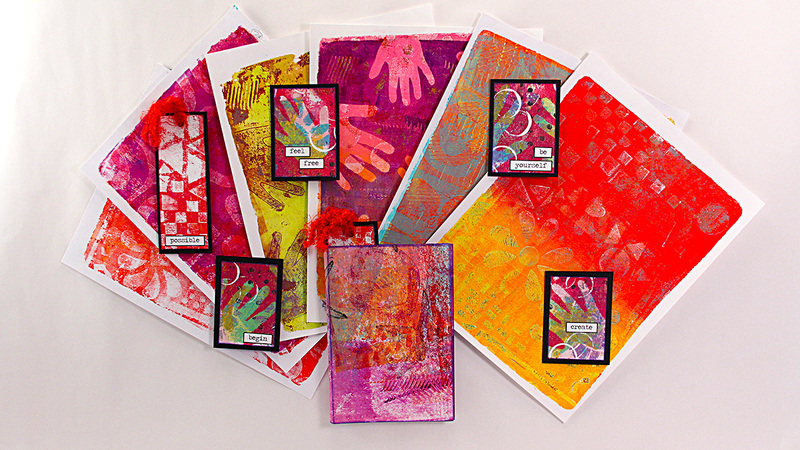 The Gelli Plate can be used like a giant ink pad, too! In this class, after exploring a few more techniques and learning how to easily use heavy body paints on the Gelli Plate you’ll find out how to get more from your favorite prints. You’ll accumulate ideas for using ghost prints and painty Deli Wrap, as well as your original layered monoprints. The essential monoprinting ingredient is FUN so let’s Get Creative and do exactly that! Download your class notes and I’ll see you in class.